Length: 43.7 metres Shipyard: Tansu Yachts Exterior/interior design: Tansu Yachts After four years in development, the third and latest launch of the shipyard was launched last year and sold just earlier this month. Featuring Tansu’s characteristic military styling and sleek silver topsides, Cyclone also features a notably large aft deck, which can be used to carry two 6.2 metre tenders, and a library. The owner’s suite on the upper deck also includes a spacious private terrace for lounging in peace and quiet. After four years in development, the third and latest launch of the shipyard was launched last year and sold just earlier this month. Featuring Tansu’s characteristic military styling and sleek silver topsides, Cyclone also features a notably large aft deck, which can be used to carry two 6.2 metre tenders, and a library. The owner’s suite on the upper deck also includes a spacious private terrace for lounging in peace and quiet. Length: 36.3m Shipyard: Moonen Exterior/interior design: René van der Velden Design/Nauta Design/ Studio Indigo Anyone familiar with Moonen will take one look at Brigadoon and see something’s different. The Dutch yard has added a fresh aesthetic to its go-anywhere DNA with Rene van der Velden’s Caribbean designs. 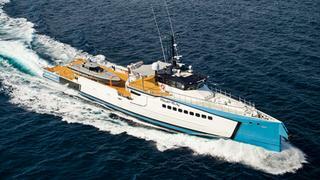 Brigadoon – of the Martinique series – embodies this with her clean modern lines. What’s not apparent at first glance is that the hull is built in high-tensile steel, a stronger carbon-rich alloy that saves weight to keep the draught at 2.1 metres and improve fuel economy. Anyone familiar with Moonen will take one look at Brigadoon and see something’s different. The Dutch yard has added a fresh aesthetic to its go-anywhere DNA with Rene van der Velden’s Caribbean designs. Brigadoon – of the Martinique series – embodies this with her clean modern lines. What’s not apparent at first glance is that the hull is built in high-tensile steel, a stronger carbon-rich alloy that saves weight to keep the draught at 2.1 metres and improve fuel economy. 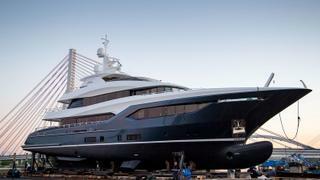 Length: 51m Shipyard: Heesen Exterior/interior design: Harrison Eidsgaard This is not a case of styling belying purpose. Irisha looks fast and she is, exceeding 26 knots in sea trials. Desiring a custom yacht, her owner requested an inimitable look and Harrison Eidsgaard delivered, sculpting a fighter jet-like profile built over Heesen’s proven 5000 Aluminium class hull. The soon-to-be charter yacht has a relaxing ambience inside with a neutral palette, lots of texture and a sophisticated lighting system. This is not a case of styling belying purpose. Irisha looks fast and she is, exceeding 26 knots in sea trials. Desiring a custom yacht, her owner requested an inimitable look and Harrison Eidsgaard delivered, sculpting a fighter jet-like profile built over Heesen’s proven 5000 Aluminium class hull. The soon-to-be charter yacht has a relaxing ambience inside with a neutral palette, lots of texture and a sophisticated lighting system. Length: 49.98m Shipyard: Wider Exterior/interior design: Fulvio De Simoni, Wider/Ideaeitalia When you think of Wider, you can’t help but envision an extraordinary beach club. This standout feature of the builder’s superyacht range shines on the new flagship Wider 165, adding a sauna to the space in addition to stowing the Wider 32 tender. The Wider 165 has the same diesel-electric propulsion as her smaller sister, the Wider 150, with azimuthal pods and a battery bank. Something new is the helicopter pad on the foredeck. When you think of Wider, you can’t help but envision an extraordinary beach club. This standout feature of the builder’s superyacht range shines on the new flagship Wider 165, adding a sauna to the space in addition to stowing the Wider 32 tender. The Wider 165 has the same diesel-electric propulsion as her smaller sister, the Wider 150, with azimuthal pods and a battery bank. Something new is the helicopter pad on the foredeck. Length: 41.84m Shipyard: Ferretti Group Superyacht Yard Exterior/interior design: Zuccon International Project, Ferretti Group The biggest ever Navetta – the first to exceed 300 gross tonnes – has the space to offer the owner total privacy and crew the means to do their jobs efficiently. The stern is an exceptional area with a large beach club that’s all about leisure thanks to a side-opening garage for launching and retrieving tenders and toys. The biggest ever Navetta – the first to exceed 300 gross tonnes – has the space to offer the owner total privacy and crew the means to do their jobs efficiently. The stern is an exceptional area with a large beach club that’s all about leisure thanks to a side-opening garage for launching and retrieving tenders and toys. 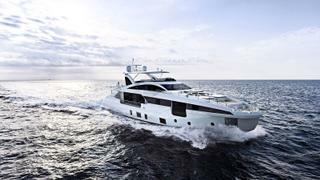 Length: 33.53m Shipyard: Riva Exterior/interior design: Officina Italiana Design, Ferretti Group Like a loft on the sea, the main deck of the new Dolcevita – the fibreglass flagship of the Riva fleet – has 270 degrees of views out of floor-to-ceiling windows and headroom suitable for pro-basketball players. This is topped by a flybridge that flows into the foredeck, forming what Riva dubs an “infinity deck” of 34 square metres. Like a loft on the sea, the main deck of the new Dolcevita – the fibreglass flagship of the Riva fleet – has 270 degrees of views out of floor-to-ceiling windows and headroom suitable for pro-basketball players. This is topped by a flybridge that flows into the foredeck, forming what Riva dubs an “infinity deck” of 34 square metres. Length: 50m Shipyard: CRN Exterior/interior design: Zuccon International Project Retro is hot right now, something Latona has embraced, drawing her inspiration from CRN’s SuperConero series from the 1960s. Adding modern-day enjoyment to the classic look are fashionable features like a balcony that can be used under way, a master cabin terrace and a beach club sporting something they didn’t have in the 60s – a drive-in tender bay that converts into an indoor swimming pool. Retro is hot right now, something Latona has embraced, drawing her inspiration from CRN’s SuperConero series from the 1960s. Adding modern-day enjoyment to the classic look are fashionable features like a balcony that can be used under way, a master cabin terrace and a beach club sporting something they didn’t have in the 60s – a drive-in tender bay that converts into an indoor swimming pool. Length: 49.9m Shipyard: Rossinavi Exterior/interior design: Team For Design/Lazzarini Pickering Architetti Flying Dagger really flies, reaching 31 knots flat out with three 16-cylinder MTUs and water jet propulsion. She does so pretty quietly too for, despite her water jets, she sounds more like a full displacement yacht under way benefitting from the latest research in noise and vibration reduction. The water jets also give her a shallow draught of only 2 metres. Flying Dagger really flies, reaching 31 knots flat out with three 16-cylinder MTUs and water jet propulsion. She does so pretty quietly too for, despite her water jets, she sounds more like a full displacement yacht under way benefitting from the latest research in noise and vibration reduction. The water jets also give her a shallow draught of only 2 metres. Length: 32m Shipyard: Azimut Yachts Exterior/interior design: Stefano Righini/Achille Salvagni This is a yacht that aims to innovate. The unusual bow, side-access tender garage and full-height windows on either side of the owner’s suite give a hint of that. The superstructure is built entirely of carbon and epoxy resin; the weight savings combined with the D2P (displacement to planing) hull, with its double chine and wave-piercing bow, deliver maximum fuel efficiency over a range of speeds. This is a yacht that aims to innovate. The unusual bow, side-access tender garage and full-height windows on either side of the owner’s suite give a hint of that. The superstructure is built entirely of carbon and epoxy resin; the weight savings combined with the D2P (displacement to planing) hull, with its double chine and wave-piercing bow, deliver maximum fuel efficiency over a range of speeds. Length: 47.6m Shipyard: Baglietto Exterior/interior design: Francesco Paszkowski Design/Baglietto Built to Lloyd’s class, Baglietto’s newest 48 metre has a traditional layout that excels in functionality, featuring a large galley and pantry, ample storage and space for tender and toys on the foredeck. The fun stuff isn’t forgotten either – the stern is dedicated to a 47 square metre beach club with steam shower, bar and additional space for a gym or spa. Up top is a vast sundeck with infinity pool. Built to Lloyd’s class, Baglietto’s newest 48 metre has a traditional layout that excels in functionality, featuring a large galley and pantry, ample storage and space for tender and toys on the foredeck. The fun stuff isn’t forgotten either – the stern is dedicated to a 47 square metre beach club with steam shower, bar and additional space for a gym or spa. Up top is a vast sundeck with infinity pool. Length: 47.2m Shipyard: Sanlorenzo Exterior/interior design: Francesco Paszkowski Design The Sanlorenzo for adventurers, the 460Exp represented an entirely new concept for the refined Italian yard when it was introduced three years ago. It was designed by Francesco Paszkowski to be self-sufficient over long ranges and carry a serious number of toys. Now the builder introduces an evolved version – the 500Exp. 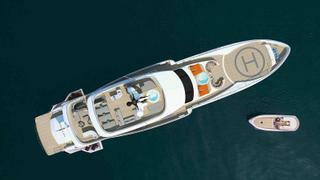 Developed in close collaboration with her owner, the 500GT yacht extends the stern area to make room for a helipad. The Sanlorenzo for adventurers, the 460Exp represented an entirely new concept for the refined Italian yard when it was introduced three years ago. It was designed by Francesco Paszkowski to be self-sufficient over long ranges and carry a serious number of toys. Now the builder introduces an evolved version – the 500Exp. 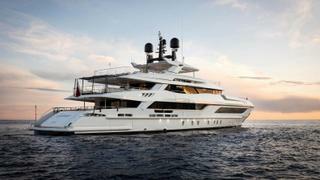 Developed in close collaboration with her owner, the 500GT yacht extends the stern area to make room for a helipad. Length: 27m Shipyard: CCN Exterior/interior design: Tommaso Spadolini, Roberto Cavalli Fashion designer Roberto Cavalli teamed up with his friend, yacht designer Tommaso Spadolini, to conceive his dream yacht. The brief called for what could be opposing criteria: maximum contact with the sea and utmost privacy – yet solutions were found to satisfy both. 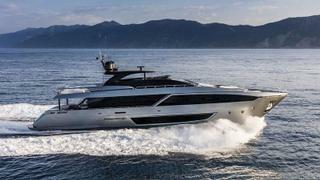 In any case, Cavalli will be hard to catch on this water jet propelled 40-knot boat. With strong styling to match his strong personality, Freedom is a one-off – what builder CCN calls “Fuoriserie”. 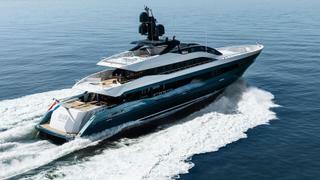 Fashion designer Roberto Cavalli teamed up with his friend, yacht designer Tommaso Spadolini, to conceive his dream yacht. The brief called for what could be opposing criteria: maximum contact with the sea and utmost privacy – yet solutions were found to satisfy both. In any case, Cavalli will be hard to catch on this water jet propelled 40-knot boat. With strong styling to match his strong personality, Freedom is a one-off – what builder CCN calls “Fuoriserie”. 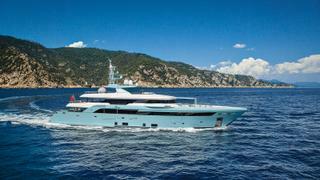 Length: 54m Shipyard: Overmarine Group Exterior/interior design: Alberto Mancini, Overmarine Group Long distance or high speed? You don’t have to choose - both are possible in the new Mangusta GranSport line. 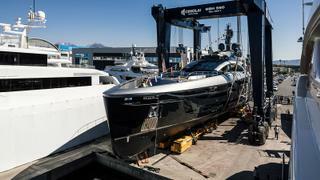 El Leon is the first of the new series and the builder’s new flagship. The all-aluminium fast displacement yacht performs optimally at displacement speed for a 3,500nm range, yet can also reach close to 30 knots when needed. 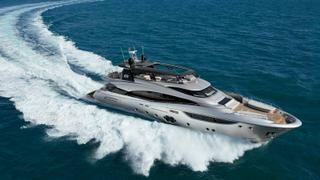 She may represent a new series, but with that muscular, dynamic styling, she’s definitely a Mangusta. Long distance or high speed? You don’t have to choose - both are possible in the new Mangusta GranSport line. 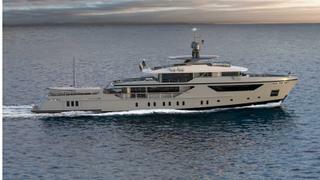 El Leon is the first of the new series and the builder’s new flagship. The all-aluminium fast displacement yacht performs optimally at displacement speed for a 3,500nm range, yet can also reach close to 30 knots when needed. 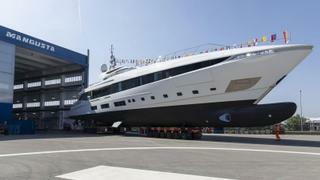 She may represent a new series, but with that muscular, dynamic styling, she’s definitely a Mangusta. Length: 57.7m Shipyard: Amels Exterior/interior design: Tim Heywood/Reymond Langton The first hull in the new Amels 188 Limited Editions, Volpini 2 sports some forward-thinking engineering. With IMO Tier III regulations looming that require world cruising yachts over 500GT to reduce NOx emissions in engine exhaust by 70 per cent, Amels decided to tackle the challenge with the new 188 ahead of the requirement. As such, Volpini 2 relies on hybrid power, combining waste heat recovery, a battery bank and two generators in a father-and-son configuration to increase efficiency and reduce emissions. The first hull in the new Amels 188 Limited Editions, Volpini 2 sports some forward-thinking engineering. With IMO Tier III regulations looming that require world cruising yachts over 500GT to reduce NOx emissions in engine exhaust by 70 per cent, Amels decided to tackle the challenge with the new 188 ahead of the requirement. As such, Volpini 2 relies on hybrid power, combining waste heat recovery, a battery bank and two generators in a father-and-son configuration to increase efficiency and reduce emissions. Length 40m Shipyard Conrad Shipyard Exterior/interior design Reymond Langton/Conrad Shipyard The largest yacht ever built in Poland, Viatoris was a custom project three years in the making from first discussions to delivery. This has laid the groundwork for a new C133 semi-custom series at Conrad with faster lead times. Reymond Langton lent its expertise to create this 40 metre beauty featuring a saloon with sliding doors on three sides and a main deck master with port and starboard balconies. The largest yacht ever built in Poland, Viatoris was a custom project three years in the making from first discussions to delivery. This has laid the groundwork for a new C133 semi-custom series at Conrad with faster lead times. Reymond Langton lent its expertise to create this 40 metre beauty featuring a saloon with sliding doors on three sides and a main deck master with port and starboard balconies. Length: 55.5 metres Shipyard: Damen Exterior/interior design: Damen Offering a blend of adventure and superyacht support functions, Power Play will be the sixth delivery of the popular YS 5009 design. Equipped with ample room for tenders, toys and submersibles, plus a 12-tonne deck crane and 50 square metre aft dive centre, Power Play is equipped for any nautical adventure. Currently under sea trials, the yacht is proving her carrying capabilities by comfortably transporting a 15 metre Damen Interceptor on the aft deck and reaching a top speed of 20 knots. Offering a blend of adventure and superyacht support functions, Power Play will be the sixth delivery of the popular YS 5009 design. Equipped with ample room for tenders, toys and submersibles, plus a 12-tonne deck crane and 50 square metre aft dive centre, Power Play is equipped for any nautical adventure. Currently under sea trials, the yacht is proving her carrying capabilities by comfortably transporting a 15 metre Damen Interceptor on the aft deck and reaching a top speed of 20 knots. Length: 32.26 metres Shipyard: Monte Carlo Yachts Exterior/interior design: Nuvolari Lenard The largest yacht of Monte Carlo Yachts’ collection, the MCY 105 has been designed inside out by Italian design duo Nuvolari Lenard and features many of the yard’s trademark features. 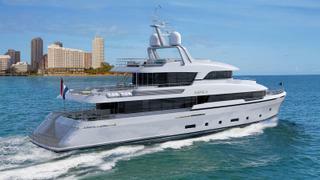 These include an ample bow lounge area, Portuguese flybridge and raised pilothouse design. The yacht also features a full beam main deck master stateroom well-lit by large windows and can reach a top speed of 27 knots. The largest yacht of Monte Carlo Yachts’ collection, the MCY 105 has been designed inside out by Italian design duo Nuvolari Lenard and features many of the yard’s trademark features. 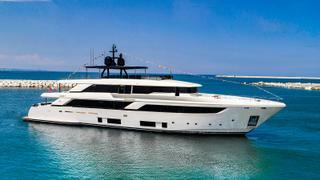 These include an ample bow lounge area, Portuguese flybridge and raised pilothouse design. The yacht also features a full beam main deck master stateroom well-lit by large windows and can reach a top speed of 27 knots. Length: 28 metres Shipyard: Dominator Exterior/interior design: Luca Catino and Alberto Mancini Zalanka’s launch earlier this month turned heads as her eye-catching metallic golden hull was seen for the first time. The yacht, which has a semi-displacement hull, features exterior design by Alberto Mancini and interiors by Luca Catino and is kitted out with a spacious tender garage and can carry two full-carbon e-bikes. 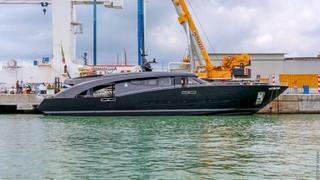 The five-cabin yacht, which is the third Ilumen 27.5 metre yacht from Dominator, is currently undertaking sea trials. Zalanka’s launch earlier this month turned heads as her eye-catching metallic golden hull was seen for the first time. The yacht, which has a semi-displacement hull, features exterior design by Alberto Mancini and interiors by Luca Catino and is kitted out with a spacious tender garage and can carry two full-carbon e-bikes. 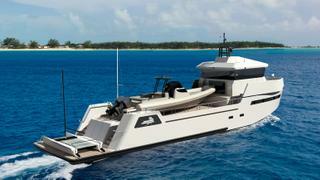 The five-cabin yacht, which is the third Ilumen 27.5 metre yacht from Dominator, is currently undertaking sea trials. Length: 27.3 metres Shipyard: Lynx Yachts Exterior/interior design: Lynx Yachts, Diana Yacht Design, Bernd Weel Design and Frank Darnet Design This 27.3 metre superyacht support vessel has been fully customised by her owner who enjoys kite surfing, scuba diving and catamarans. 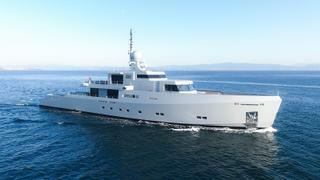 She will accompany the mother yacht with a plethora of toys and offer additional accommodation to guests. Exterior design of the sporty support yacht comes from Bernd Wheel Design while the interior is styled by Darnet Design and the engineering was handled by Diana Yacht Design. This 27.3 metre superyacht support vessel has been fully customised by her owner who enjoys kite surfing, scuba diving and catamarans. 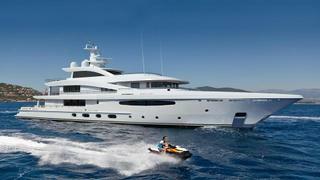 She will accompany the mother yacht with a plethora of toys and offer additional accommodation to guests. Exterior design of the sporty support yacht comes from Bernd Wheel Design while the interior is styled by Darnet Design and the engineering was handled by Diana Yacht Design.